My Favorite Things: Stretch Those Toes, Baby! 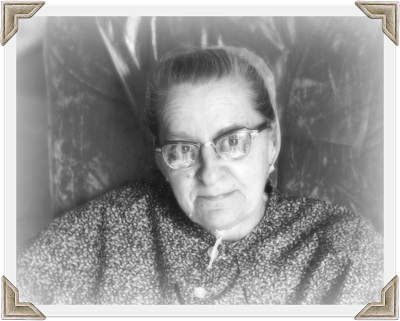 Nothing will ever be as dear to me as my sweet mother was and the lingering memories of her. She has been with Jesus since 2010....I can't believe she's been gone that long. ...but something that I wish I hadn't gotten. Bunions that I don't ever want to become like hers. as to why her feet (specifically her toes) looked like that. including the numerous bunion and corn pads. I only want to help others by sharing this. I remember it nearly causing me physical pain just to look at them. She had the hardest time fitting into shoes, to say the least. But what I don't understand is she always wore sensible shoes...never high heels or pointed toes. Maybe just ill-fitting ones but no doubt she was on her feet a lot raising those eight kiddos! I guess I probably noticed the beginning of bunions forming in my late 30s to early 40s. I was guilty of cramming my feet into those high heeled, needle nose torture chambers. But only for short amounts of time to church or special occasions...never on the job. 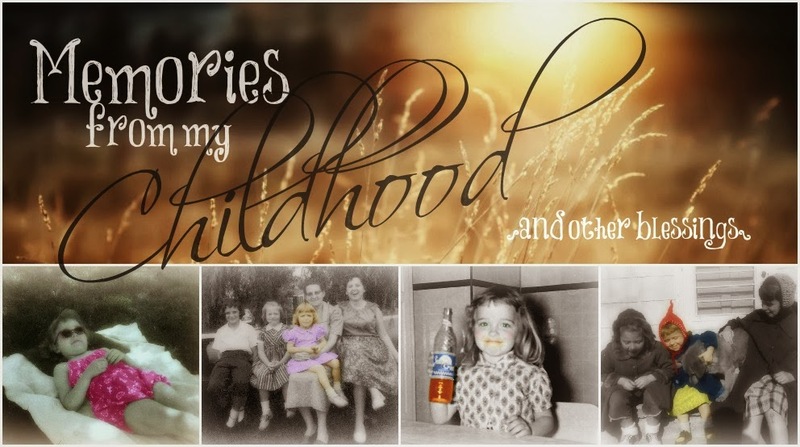 In fact, my favorite "shoes" were the ones I was born wearing. Then of course, there were my flip-flops....still, my go to favorites. 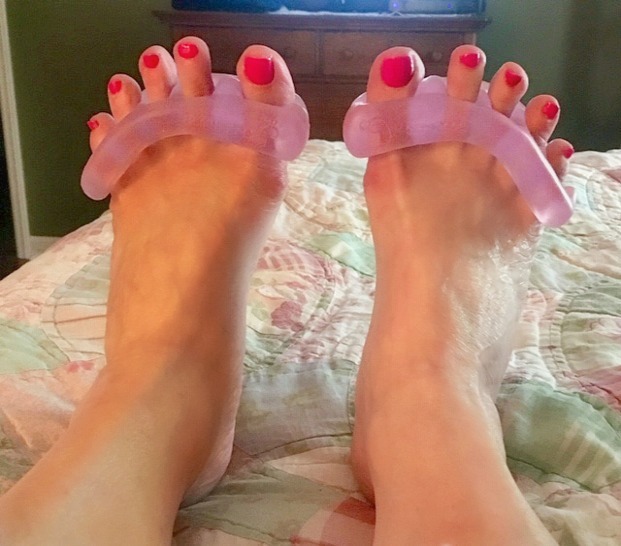 When I first started noticing the bunions, I became determined to keep them at bay! although I may have simply offered my humble opinion about this or that. I am not getting paid and no one affiliated with the product has asked me for a review. Probably more than ten years ago, I came across an ad in the back of a magazine. It was for Yoga Toes and they immediately got my attention. Yes, they have been around a good while. Fast forward to...whenever...I cannot even locate my order on my Amazon account. I thought for sure that's where I got them but I may have ordered from the Yoga Toes site. I lost them somewhere in a messy drawer I misplaced them and couldn't find them anywhere! That would be until just a couple of weeks ago and I nearly jumped for joy when I found them! ...but now that I think about it, maybe, just maybe I would have! I knew they had to be here somewhere...and, of course, they were. and plopped them on my feet for a couple of hours while I watched my afternoon cooking shows. ...and it probably also depends on your specific toes. and her interest in them encouraged me to write a post about them......so here it is! In all honesty, I had forgotten just how wonderful my feet felt during and after the stretch. These are not something you can wear to walk around in nor wearing them to bed for the night. ...maybe 10-15 minutes at first and gradually work up to an hour or longer. I had mine on for probably at least 2 hours, maybe a bit longer. It's also important that you get the right size so they aren't uncomfortable but give a good stretch. Over time, my big toes have become more and more numb, due to bones pressing on the nerves. I always wear silicone toe spacers with closed-in shoes and socks and also while sleeping. They do keep the big toes more in line and they have also helped me greatly over the years. 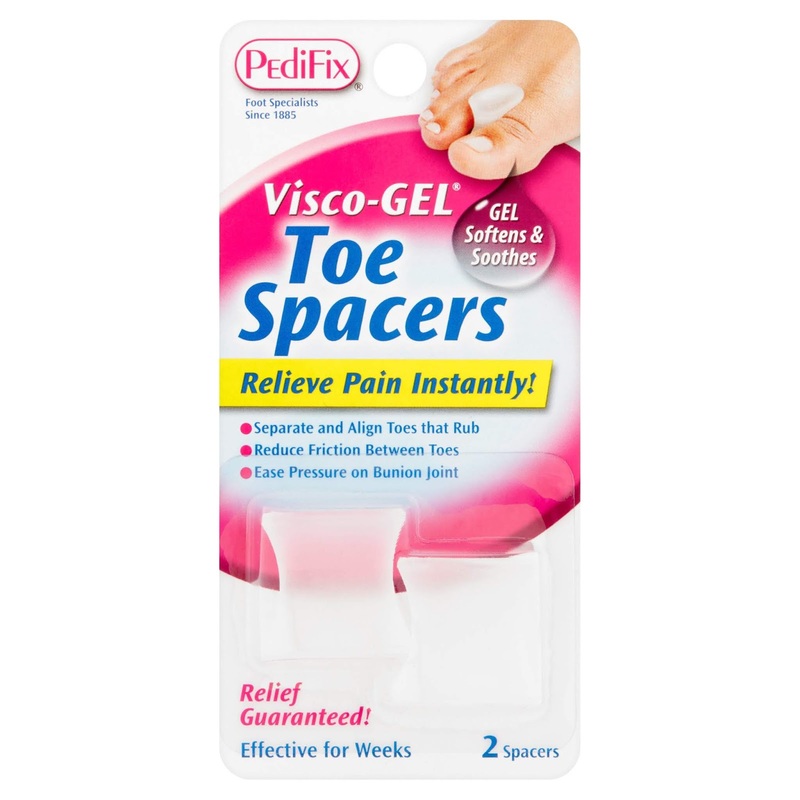 I purchase these at Walmart and they are soft, comfortable and do a great job. But the thing about the Yoga Toes is the actual stretch they provide for your feet and toes. It is highly beneficial to exercise and stretch other joints and muscles in our body, right? So why not our feet and toes as well since they carry all of our burdens all day long! You can read about the therapeutic benefits by clicking here. 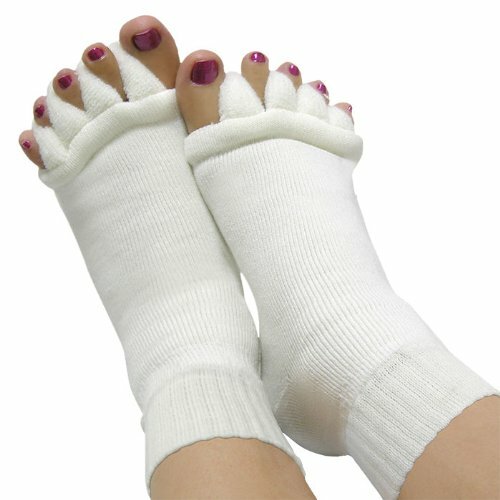 I have these cozy socks as well, which also provides a comfy "posture" for your toesies. ...but was afraid to ask. Have you ever tried them?? That is very interesting. I do not have a problem with bunions, so I have never even heard of these things. It sounds like a good alternative to having surgery to have the bunions removed. Well look at that. My mom could have benefited from those. I'm going to track those toe spacers down at Wal-Mart. Thanks for sharing except for that firs photo. Yikes. My mom's got pretty bad, too. Grandma's feet always looked like they hurt. I have never heard of these either but I might try them just for a good stretch now and then. Oh my, your poor grandma's toes!! I could use one of those spacers. My feet... ugh. Thanks for sharing these products with us! My mom has this problem and she has even had surgery on her feet. Your poor mama! You are wise to use the tools that you have found to help, both the Yoga Toes and the toe spacer. "An ounce of prevention . . . " as they say. See, I told you, all kinds of us gals wanted to know about these. I'm about to order my son a pair and may order myself a pair. I have no feet issues but I'm betting these just make your feet feel better. Thanks for this most informative post! And, your sweet Momma's feet, that pains me to look at that picture. Oh my those feet pictured are painful to look at. Never heard of those toes stretchers. Those feet must have caused a lot of agony. Your poor, sweet Mother! Hopefully you can save yourself from that level of pain. 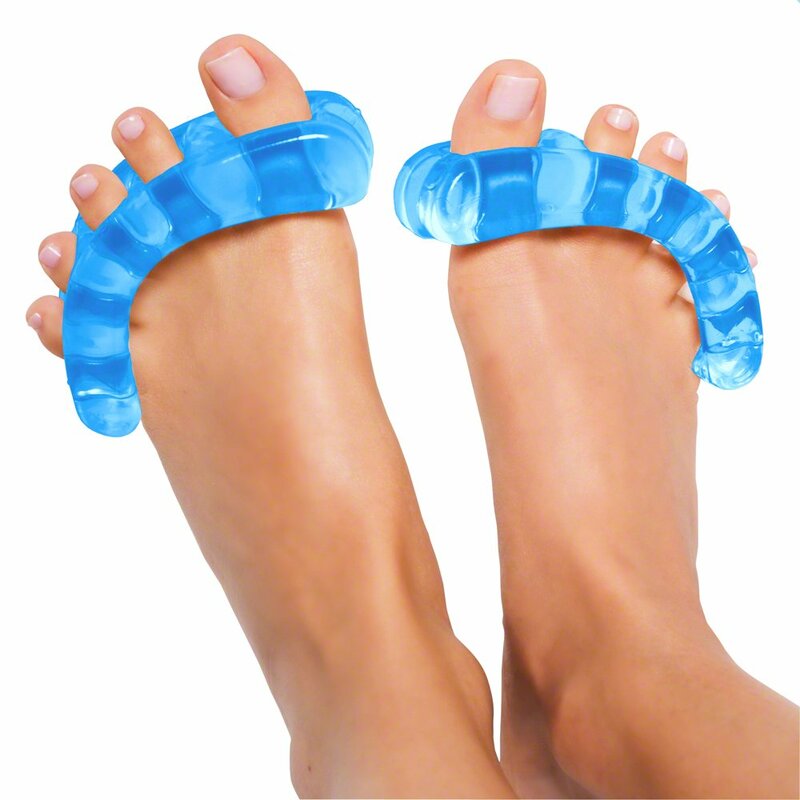 I'm going to look into these "Yoga Toes," because stretching is a very good way to maintain our bodies. Thanks for sharing the photograph of your Mom. Thanks too for sharing the information about toes! We do need to look after our feet … I'm sitting wiggling my toes now! LOL! Oh my goodness, I have never heard of "yoga toes". What a fascinating and educational post, Debby. I remember my mum having bunions. Would you believe she always cut holes in her shoes to allow for her bunions!!! !